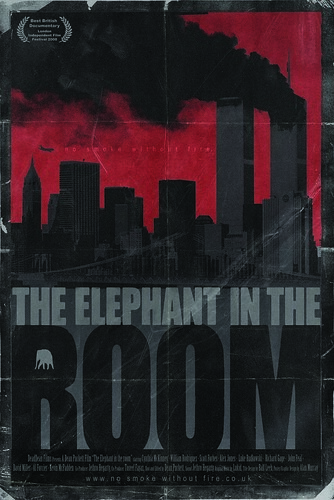 The Elephant in the Room is a documentary following British filmmaker Dean Puckett through his journey into the 9/11 Truth Movement: a global movement of 'conspiracy theorists' who believe that the official explanation about what happened on 9/11 is totally or partially inaccurate. The filmmakers travel from middle England, across Europe and to New York for the six year anniversary of the attacks, where the film takes one final twist as we are introduced to the 9/11 first responders who are suffering from various grave health difficulties due to the toxic dust that they breathed in trying to help their country during the weeks after this tragic event. Told with a personal hands on approach that avoids advancing any one position, the film asks the question: are these crazy conspiracy theorists? Or is 9/11 Truth a credible political movement? patrick on Thu, 08/21/2008 - 3:17pm. Gareth on Thu, 08/21/2008 - 3:31pm. Another nail in the coffin of the no planers. Infowarrior on Thu, 08/21/2008 - 9:09pm. Scott Forbes relates compelling experience! Scott Forbes' testimony to the power down remains compelling. His tale of the dust everywhere on his floor and the gut feeling the catastrophe was related to the weekend activities, helped make 9/11 Mysteries so good! Forbes shouldn't settle for facts because his story is a clarion call! Forbes tried on more than one occasion to contact the FBI but they weren't interested! Is anyone surprised at this point? alllans2k7 on Sat, 08/23/2008 - 10:47am. The people over at JREF claim that Scott Forbes is an attention-seeking fraud. Of course, they have no evidence of that, except they claim that thousands of people would come forward with this information if it really happened. What a convenient point of view considering thousands of the potential witnesses they're referring to were killed that day. Their argument also fails to consider that he attempted to alert the 9/11 Commission about this, multiple times, before going public with it. Is that typically how attention seekers operate? No, it's not. Luckily, the only people who buy into the nonsense of organized skeptics are... other organized skeptics. They claim to be critical thinkers, but their fallacy- & insult-laden arguments demonstrate otherwise. deepb on Thu, 08/21/2008 - 11:51pm. Are raised on a regular basis against William Rodriguez, and claims that everyone from Richard Gage to Kevin Ryan to Steven Jones to Tony Szamboti are liars, you really have to place this in some context. 9/11 skeptics have two peer-reviewed papers in scientific journals. If these journals are so easy to get published in, where is the peer-reviewed rebuttal? Reprehensor on Fri, 08/22/2008 - 5:30am. Although I meant to reply to this comment with my pseudoskepticism link, I do agree with you- the best example I can think of is whenever they talk about how conspiracy theorists are looking for "comfort". deepb on Fri, 08/22/2008 - 1:03pm. I have no idea how to get in touch with Scott, so I'll post this question here in case someone does know. Based on everything Scott has said, the PA notified his company of this power down, claiming it covered some percentage of the building. What portion of the building did the power down cover? Also, was it visible from the exterior at night? In other words, did he confirm that they really did shut off power everywhere they said they would? Or is it possible that they only contacted certain offices or certain floors, misrepresenting the power down as "global" in order to limit suspicion? deepb on Thu, 08/21/2008 - 11:59pm. Think about some of their claims - like compressed air causing the squibs - they have no proof of that. The same can be said for most of their other counter claims. deepb on Fri, 08/22/2008 - 11:36am. LEH on Fri, 08/22/2008 - 4:50pm. Although I haven't read or heard anything from him in a while, I'm pretty sure he fits the description as well. True skeptics do not make claims of their own - including negative claims. For example, "the Loch Ness Monster does not exist". That negative claim is just as unprovable as "the Loch Ness Monster does exist". JREF is full of people asserting negative claims with the assumption that they have no burden of proof. They also believe that any evidence that does not definitively prove something ceases to be evidence (which is why so many of them make the audacious claim that there is 'zero evidence' of a conspiracy on 9/11). Many (if not most) of the JREF debunkers I've interacted with are reformed believers of some kind - at some point in their adult life, they strongly believed in either the paranormal, UFOs, cryptozoology, or something else along those same lines. Then, for whatever reason, they decided to become skeptics and "learned" how to think critically. Although they all believe they are masters of critical thinking, their beliefs predictably align with (what they perceive as) mainstream scientific opinion. It's pointless to debate them, because they'll always find a way to shoehorn any imaginable evidence into their worldview (e.g., eyewitnesses were mistaken, qualified experts are insane, etc). deepb on Fri, 08/22/2008 - 11:58pm.